It seemed incongruous, so close to the red light district. It’s like, feast your eyes on half-naked women in glass cases, feast your mind on weed ice-cream and cake and then feast your eyes on dead, yes dead bodies in glass cases. If not for the fact that I don’t do drugs, I would’ve thought I was out of my mind. 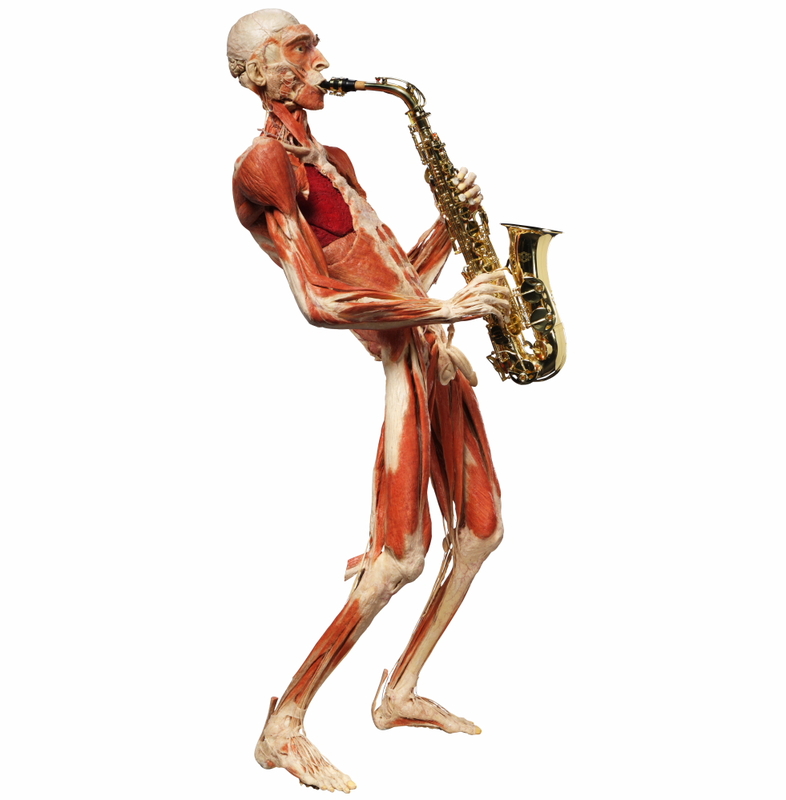 A plastinated body in a saxophonist post. But Body Worlds is not new to me. 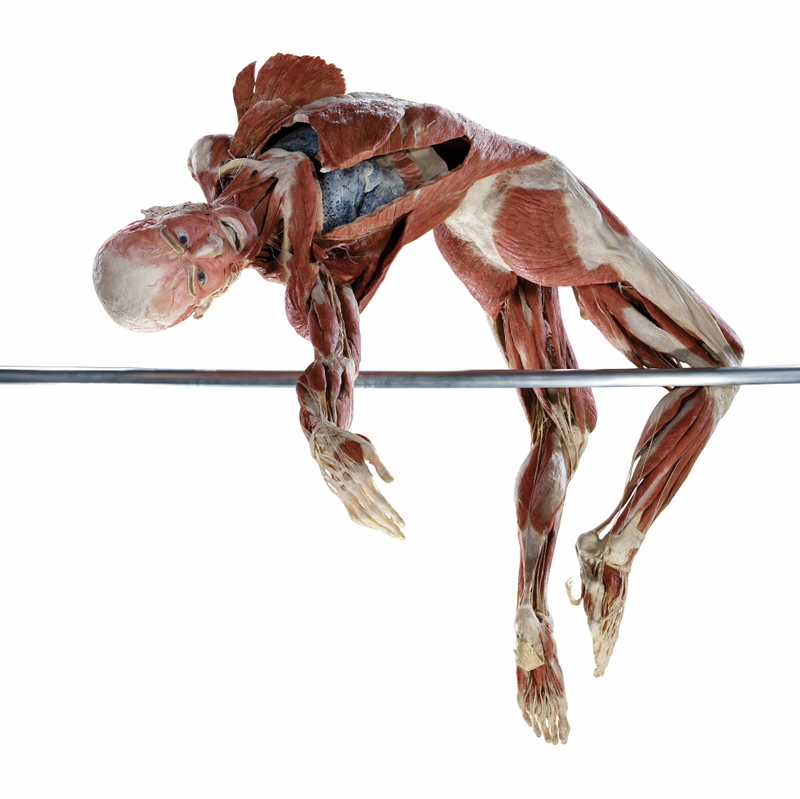 Since 2002 when Dr Gunther von Hagens brought his macabre exhibition to London, I had been hoping for another chance to look at these plastinated bodies and body parts at one of his numerous travelling exhibitions. It was great to stumble upon this permanent exhibition in Amsterdam, a 5-minute walk from Centraal Station. The London show was a controversial event, which almost didn’t happen because of various objections some of which came from the medical fraternity, who many of us feel, didn’t want the science of anatomy to be demystified. But despite this, the public flocked to see this “corpse show,” as the tabloids called it. Jumping off the fence showing the spinal column. 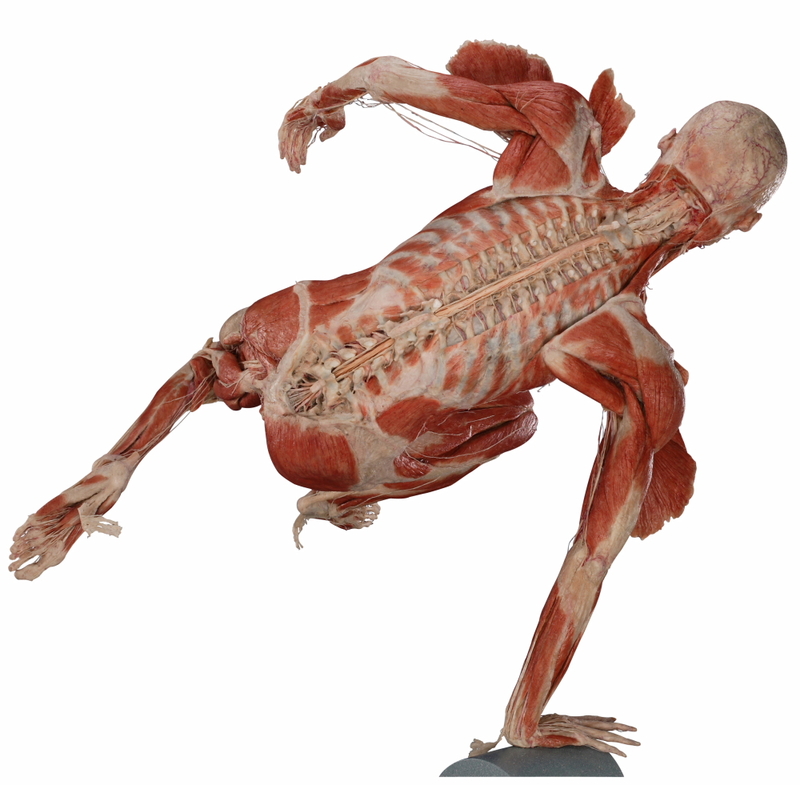 As a person who enjoys weight-training, I have long been fascinated by the beauty of the human body, especially the muscles, so it was great at the time to see the way Von Hagens and his creative designer, Dr Angelina Whalley had managed to present these specimens, devoid of skin, in so many athletic poses. At that time I was battling plantar fasciitis (heel spur) and was able to study the ankle on one of these specimens and understand how the problem was caused and avoid further damage. Plastination is a technique invented by Von Hagens at the University of Heldelberg in 1977 to produce specimens of body parts for use in medical training. In 1990, after much experimenting, he managed to apply the same technique to preserve dead bodies by replacing body fluids with plastic. A full body plastination takes 1500 hours to complete. 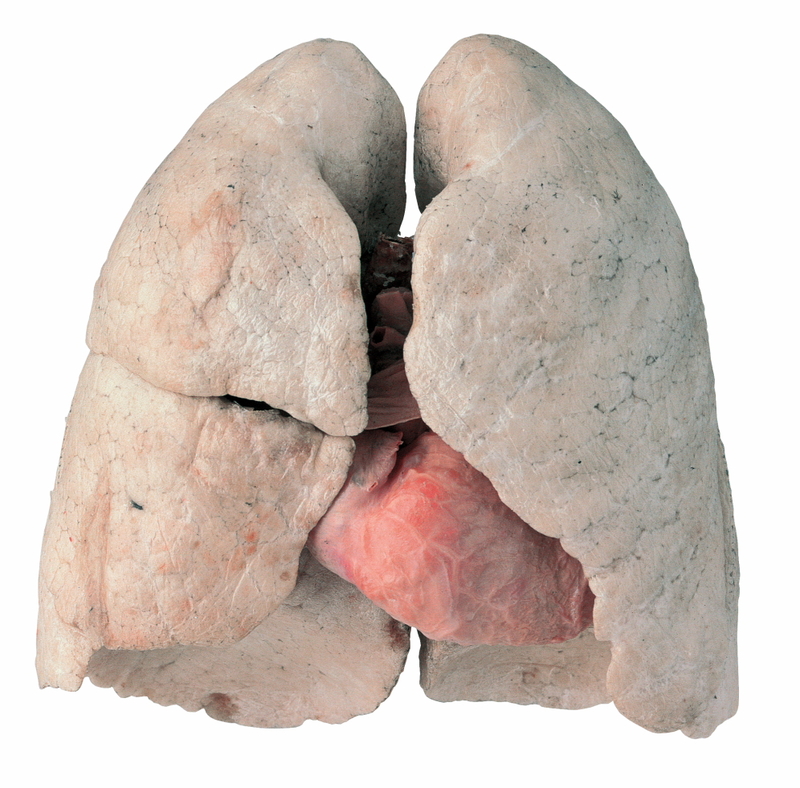 A smoker’s blackened lungs and a specimen of healthy lungs. The Amsterdam exhibition, themed “The Happiness Project,” has 200 specimens of human bodies to demonstrate the complexity, resilience and vulnerability of the human body. Ballet dancer with prosthetic knee. Among the full body specimens that caught my attention was a couple in a ballet pose, the woman with a prosthetic knee joint. In one glass case, knee joints affected by arthritis sit together with healthy ones and those with prosthetic joints – no hospital can better educate patients preparing for a knee replacement. A high-jumper strikes an impressive pose flying over the pole, although on close scrutiny you see that inside his ribcage are the smoker’s blackened lungs. In another room you get to see a display of another pair of blackened lungs next to healthy ones. 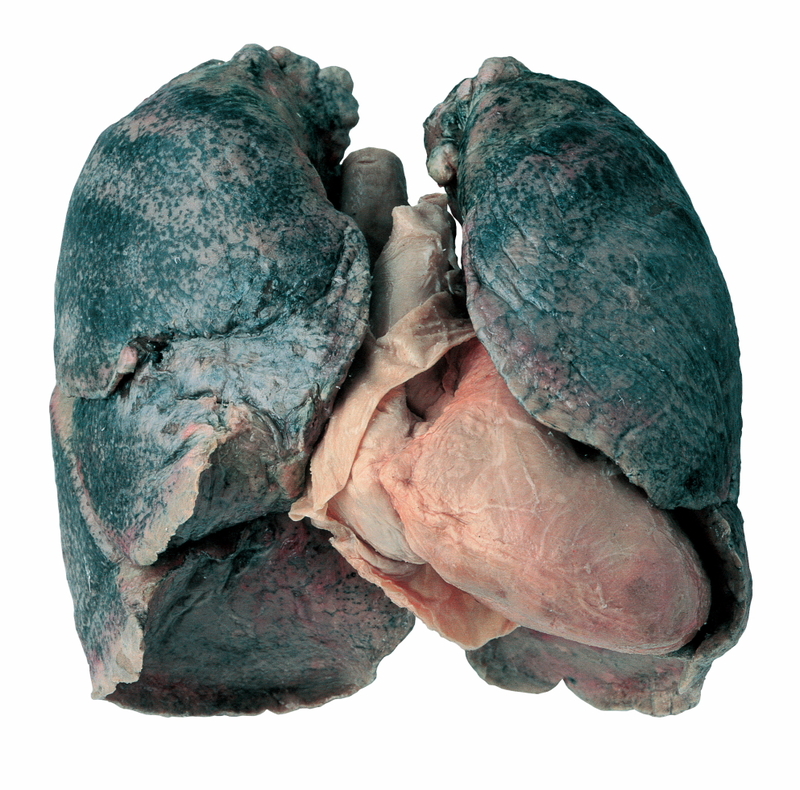 According to Body Worlds, many a visitor has vowed to quit smoking on seeing this exhibit. Drinkers might rethink that extra pint seeing the shrivelled liver on display. Elsewhere, I got drawn to the display of the bottom half of a man, devoid of flesh, with only his blood vessels showing, dyed florescent red. It looked like a beautiful piece of wire sculpture. The intricate blood system of the legs. 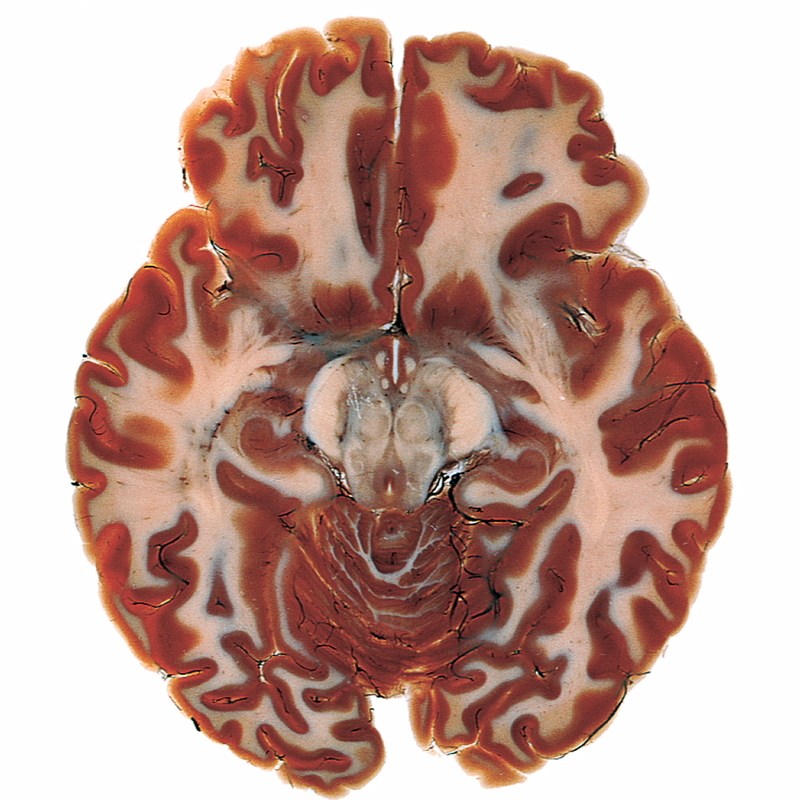 I was also fascinated by the horizontal brain slices, which remind me of the face of the Predator from the movie. 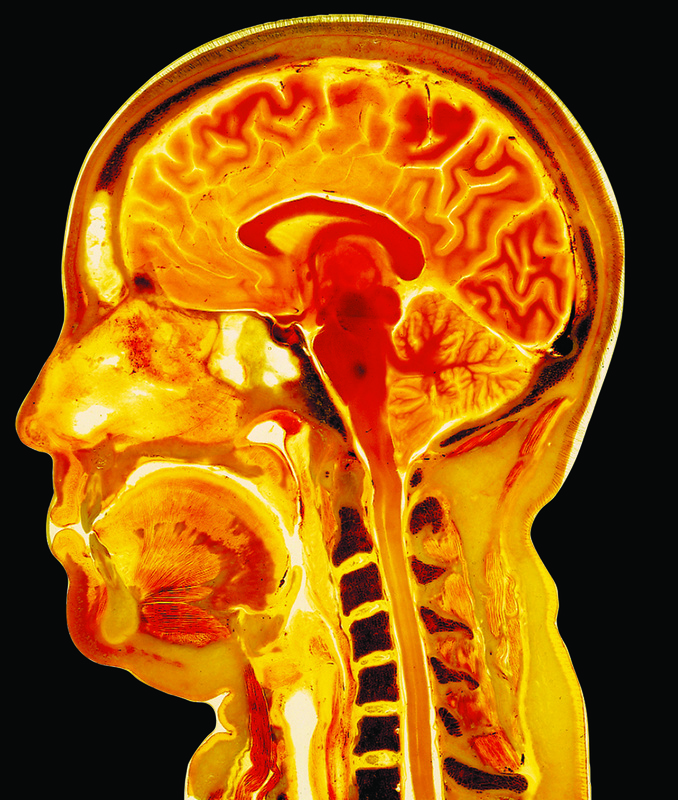 Horizontal slice of the brain resembling the face of the Predator. Also intriguing are the horizontal and vertical body slices, resembling colourful perspex, that are dangerously similar to fancy chopping boards. What a thought to shop your meat on something like that! Vertical slice of the head resembling a fancy perspex chopping board. Von Hagens also plastinates animals; his best must be the rearing horse which was in the London exhibition, with the rider holding his brain in one hand and the horse’s in the other. 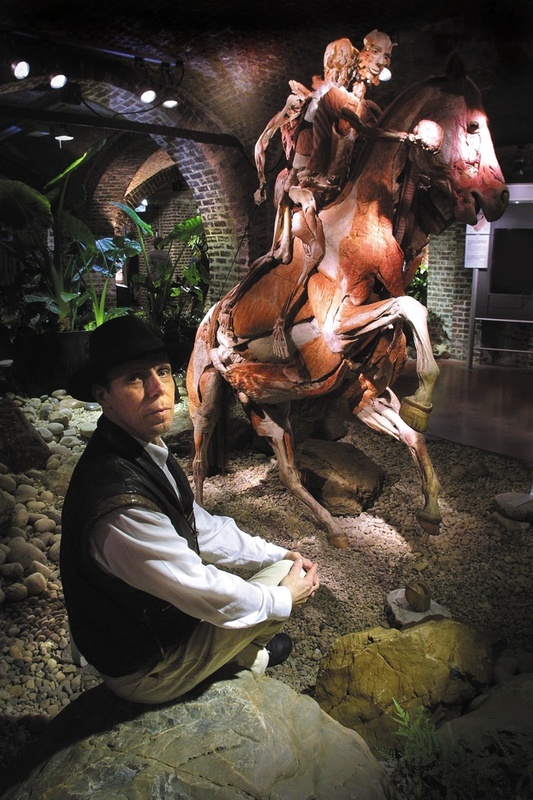 Dr Gunther von Hagens with the rearing horse. Since the first exhibition first opened in Japan in 1995, nearly 40 million people throughout the world have visited BODY WORLDS exhibitions, with events simultaneously held in five different cities. 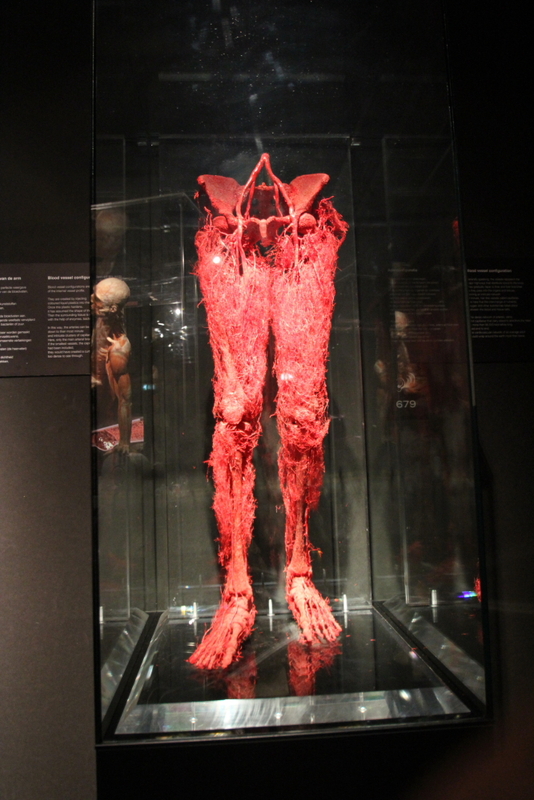 This entry was posted in Amsterdam, Tourism, Travel and tagged Bodyworlds Exhibition, Macabre. Bookmark the permalink.